Sega-16 recently sat for a spell with former Sega of America president Tom Kalinske, and the wealth of information he had to share was astounding. From the company’s internal rivalry to the missed chance Sega had with Sony to develop a joint console and everything in between, Mr. Kalinske shed new light on everything Sega! Want more info? Then check out our exclusive, in-depth interview and see how it all happened! 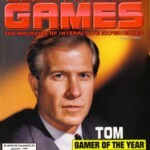 Sega-16 takes a comprehensive look at the tenure and sudden departure of the most successful CEO in Sega of America history in the article Tom Kalinske: American Samurai.